I'm not likely to start trumping the Conservative party's current claim to being the better crime reduction team. For starters we already have a prison system crisis and the Conservative's likely stated policy of being 'tougher' on crime (increasing sentencing?) would appear nothing more than an unfeasible thought experiment. But David Cameron does have one particularly good point about the police: the paperwork. 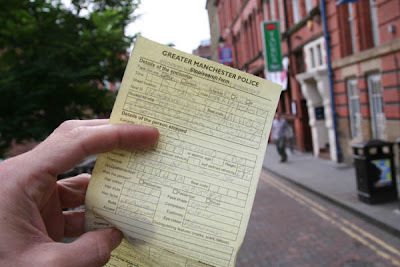 The police, often justifiably, have to fill in and provide a copy of quite a form when they interact with a member of the public. There's a 'stop and search' form, which under circumstances where your person has been inspected by an officer then fair enough both parties have a record of the encounter. However, there is also a 'stop' form, whose lack of utility and time wasting potential is far more paramount. I have quite an example. In the photo above you can see 'My Stop Form', so how did I end up with this? Taking photos. Of a Public Building (photo below). Shock horror, etc. To be fair, the police did have some albeit tenuous grounds of 'suspicion'. 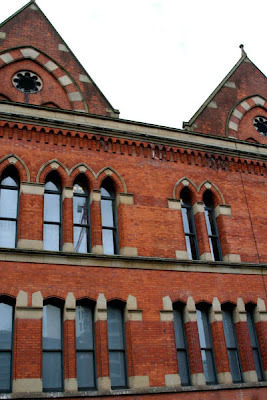 I was in my hometown of Manchester out for the day taking photographs, because that is what I do sometimes. One of the buildings I thought of adding to the ever growing gigabytes of jpegs (that god only knows how I will keep on top of) is in the other photo below. Now, despite me being (quite a proud, we do that) Mancunian I didn't have the faintest idea that this building was in fact the Court House, another Mancunian-at-home characteristic I expect. As I approached from the side, I also had even less idea that there was an important Father's 4 Justice case going on that day. In retrospect, there were quite a lot of police around the area, but that isn't necessarily anything unusual these days, hence I didn't attach any significance. However the police did and called out to me. Now we could fast forward a full 15 minutes in time and lose nothing significant in the process. Myself and the officer bid each other farewell and went on our business. The police were reassured that I was a local (it says Accent: 'Northern' on the form) photographer doing what it says on the tin. I was just ever so slightly disgruntled for being disturbed but not distraught at my treatment by the Bill. So why the quarter hour? The bloody form of course. What a joke! The officer had accurately ascertained the insignificance of my presence in the first 5 microseconds of our meeting. We talked, I showed him some pics on my camera (the benefit - or the disadvantage? - of digital photography) and that should have been that. But no, some bureaucrat, likely inexperienced in any such grass roots activity as being on The Beat, has prescribed the 'stop' form. In this case, how silly. What a typical waste of time. Mine and theirs. The police have nothing to gain by having a record of this 'stop'. If some poor temp has to enter it into a database then there is no value in the information stored. Of course unless someone, cough, 'loses' the data and has all that marketing information to sell, but that's another story. If I really wanted a written record of the conversation then I should be able to request it. But in such an inconsequential situation why is the officer obliged to complete the form? It's just more not-thought-through-properly nonsense. I wonder how many 15 minute slots are wasted in the UK every day by this palava? Equating how many man-hours of police time? You never know, if the police only used the form when either party requested, the cost saved could make up the shortfall in the police pay negotiation. Interesting thought. No wonder the police are wanting to strike. Strike? Police? Yes and absolutely without precedent. Anywhere I believe. But here in the UK the police are considering seeking the right to strike for the first time. [Not totally without precedent: I stand corrected.] And for once I don't blame them. I'll leave you with one last thought: Whose idea do you think it was to send computer-written Victim Support letters and Support Packs to Victims Of Mobile Phone Theft? I doubt it was the Police.